Yaesu FT-1000MP – коротковолновый трансивер, сочетающий в себе лучшие классические схемные решения с современными технологиями цифровой обработки сигналов. Встроенная система EDSP, предоставляющая в распоряжение оператора мощные инструменты для обработки сигнала, в сочетании с высококачественными высокочастотными узлами и удобной многофункциональной системой управления делают этот аппарат одним из лучших из всего многообразия выпускаемой в настоящее время коротковолновой любительской техники. Он способен доставить удовольствие и любителю DX, и оператору, много работающему в соревнованиях. FT-1000MP позволяет работать всеми видами излучения во всех любительских коротковолновых диапазонах (1.8-30 МГц). Встроенный сигнальный процессор в режиме приема обеспечивает четыре различных режима подавления шумов и четыре “контурных” фильтра, обеспечивающих значительное улучшение читаемости полезного сигнала. Два независимых приемника обеспечивают возможность приема на двух частотах в пределах одного диапазона. Выбираемые пользователем аналоговый и цифровой демодуляторы. Система подавления импульсных помех в основном и дополнительном приемнике. Цифровая система обработки сигнала в режиме передачи. Память на 99 частот с возможностью сканирования. Система сдвига полосы пропускания фильтра основной селекции. Возможность прослушивания двух приемников раздельно в левом и правом канале стереофонических наушников. Поставляемый в стандартной комплектации электромеханический фильтр фирмы Collins с шириной полосы 2.75 кГц по промежуточной частоте 455 кГц. Электромеханический фильтр с полосой 500 Гц может быть установлен дополнительно. Выбираемые пользователем кварцевые или электромеханические фильтры. Независимый выбор фильтров по 2-й и 3-й промежуточным частотам. Одновременный прием на двух частотах в одном диапазоне с независимыми S-метрами. Раздельные (и выбираемые пользователем) резонансные или апериодические приемные предусилители для высокочастотных и низкочастотных диапазонов. Комфортабельная система настройки "Shuttle-jog" с регулируемой скоростью перестройки. Система CAT, позволяющая управлять трансивером с компьютера и встроенный конвертер уровней для прямого подключения к порту RS-232 (разъем DB-9 на задней панели). Разъемы на задней панели для подключения трансвертеров на диапазоны 50, 144 и 430 МГц с прямым отображением рабочей частоты. Два переключаемых пользователем антенных разъема и дополнительный разъем для приемной антенны. Два разъема для наушников (3/4” и 3.5 мм) на передней панели с независимой регулировкой уровня сигнала. Система меню для установки параметров трансивера. Банк памяти с быстрым доступом на 5 каналов. Выбираемое оператором ограничение выходной мощности до 10, 50 или 100 Вт с возможностью плавной регулировки. Режим репитерного разноса и генерации CTCSS тонов для работы через ретрансляторы 10-метрового диапазона. Возможность подключения внешней клавиатуры для расширенного управления трансивером или телеграфным ключом с памятью. Управление тоном самоконтроля в режиме телеграфа с передней панели трансивера. Программируемая пользователем панель на дисплее, отображающая по выбору частоту, записанную в память, тон самоконтроля телеграфного ключа, clarifier offset, или значение разноса при работе на разнесенных частотах. The World of HF Design has just taken a giant step! For more than half a decade the FT-1000 has been highly acclaimed by the world's top DX'ers. Now Yaesu has created a new HF masterpiece, building upon proven RF design techniques while introducing a new technology to the Amateur Radio market: Enhanced Digital Signal Processing. With its outstanding receiver section (featuring Collins Mechanical Filters), a clean and versatile transmitter, plus outstanding ergonomics, the FT-1000MP brings a new level of HF performance and design excellence to the world's most demanding amateurs. Having long ago broken through the 100 dB receiver dynamic range barrier, Yaesu has now revolutionised the sophisticated area of digital manipulation of signal waveforms through the introduction of Enhanced Digital Signal Processing (EDSP). Through skillful software design and hundreds of hours of on-the-air evaluation, the Yaesu design team has created an impressive array of noise-reduction and interference-rejection filters never before available in the communications industry. Mindful of the critical need to preserve signal-to-noise ratio and IF skirt selectivity throughout the receiver, Yaesu engineers have retained the wide variety of IF filters and high- intercept front end which made the FT-1000D a best-seller Using this RF/IF design as a foundation, and the FT-1000MP's EDSP system and Collins Mechanical Filter, the result is a uniquely clean- sounding transmitter, receiver performance second to none, and a total communications package without peer in the Amateur Radio industry. Two 10-bit and three 8-bit direct digital synthesisers are used in the FT-1000MP local oscillator system. Driven by a single TCXO master oscillator, these synthesisers produce extremely fine tuning in thirteen user selectable steps down to 0.625 Hz. The multiple DDS system provides pure local signals which form the foundation of the outstanding receiver and transmitter performance. A choice of optional TCXOs ensures state-of-the art stability--ideal for digital operations. 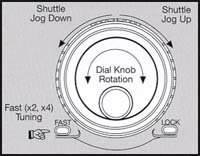 The Shuttle-jog Tuning Knob may be routed in either direction and provides efficient QSY instead of spinning the VFO knob. The more the "jog" ring is moved from the center, the progressive frequency steps increase. The Shuttle- jog tuning steps and stepping speed are accessible from the Menu system. In addition to the revolutionary new Shuttle-jog Tuning Knob, the FT-1000MP has five other tuning methods, Main and Sub VFO Tuning Knobs, Direct Keypad Entry, Panel and Microphone Up/Down Keys and Memory/VFO CH Selector. Essential for efficient contest and split frequency DX operating, the Dual Receive feature of the FT 1000MP allows the operator to watch both sides of a pile up, or monitor QSOs on two different frequencies and modes within the same band. The Main and Sub VFOs can be placed in the "tracking" mode, allowing efficient diversity operation with a touch of a button. The sub-receiver has its own S meter, too! The FT-1000MP introduces the Yaesu exclusive Enhanced Digital Signal Processing system to the world of HE operating. Operational both in receive and transmit modes, EDSP provides 4 random-noise reduction protocols, audio enhancement with 4 voice response equalisation programs for both RX and TX, and an automatic notch filter which identifies and eliminates multiple interfering carriers or heterodynes. Selectable contours of the EDSP bandpass filtering offer low, mid, and high- range roll-off responses, allowing the operator to cope with changing interference conditions. Improved signal-to-noise ratio, razor-sharp selectivity curves, and outstanding transmitted signal clarity are yours with the exclusive EDSP system. For SSB, CW and AM, the receiver 3rd IF output is applied to a special 10.24 kHz EDSP IF for demodulation and processing. The selectable digital bandpass filters provide optimised bandwidth and frequency response. In addition to a highly-effective dual mode IF Noise Blanker, the FT-1000MP boasts an EDSP Noise Reduction system with 4 noise reduction protocols to help with changing noise characteristics. Unique DSP filter networks aid in QRM reduction. Select Low, Mid, or High-cut responses or band pass filters from the front panel. Use the different contour selections to enhance intelligence recovery under different interference situations. Three EDSP RX equalisation contours provide the operator with unmatched flexibility in reducing interference. Early-stage transmitted SSB audio is applied directly to EDSP circuitry for processing. EDSP fitter parameters can be matched to voice characteristics. The result is optimum audio tailoring and sound clarity! The EDSP system of the FT-1000MP allows selection of one of four low frequency cut off parameters, so as to provide the best match to the operator's voice characteristics. Multiple notch capability within the AF passband is possible with EDSP. The digital notch circuitry continually analyses the AF passband and the correlation of the signals present, identifying and notching out heterodynes as they appear. Well known since the early '505, Collins Mechanical Filters have dominated the high end SSB, CW and, AM filter market. The built in Collins Mechanical Filter operates at a center frequency of 455 kHz with a band width of 2.75 kHz (500 Hz Collins Mechanical Filter is optional. Collins Mechanical Filters ensure superior IF performance, thanks to their fiat passband response, excellent skirt selectivity and very low inter- modulation distortion. The Collins Mechanical Filters used in the FT-1000MP are manufactured to the same standards as those used by commercial airlines, ships at sea, and the armed forces. These filters are ideal for voice, CW or digital modes of operation. Both dual and monaural receive are possible with stereo headphones (YH-77STA). Headphone configurations include: * Mono-Both Main and Sub receiver audio combined equally in both ears. * Stereo 1-Main receiver audio in left ear; Sub receiver audio, right ear. * Stereo 2-Audio from each channel in each ear with Main receiver audio enhanced, left ear; Sub receiver audio, enhanced, right ear. Constant level stereo audio is also provided via the rear panel AF output jack. Ideal for shortwave listening, the synchronous detection system of the FT-1000MP provides less fading and improved signal fidelity, compared to previous AM detectors. Additionally, both 2.4 kHz and 6 kHz IF filter bandwidths may be used in the AM mode. Or simply use the Dual Receive capability of the FT-1000MP on opposite sidebands (LSB and USB) as another method to reduce interference. The FT-1000MP contains 99 regular memories, 9 special "band limit" memories, and 5 QMB (Quick Memory Bank) memories. Each stores both RX and TX frequencies and modes, IF bandwidths, Clarifier status, and "split" status. All memories can be freely tuned or copied to another memory. The QMB feature allows storing a station quickly without overwriting one of the "Main" memories. The FT-1000MP is unmatched in its array of features especially designed for CW operation at the highest levels of competition. Included are: *Full break in keying with programmable envelope delay. Built in electronic keyer with memory (external keypad required). CW Spot for easy zero beating on desired stations. CW Pitch control for BFO and side tone/spot frequency, adjustable from 300 to 1050Hz. CW Reverse selection, allowing the use of either USB or LSB BFO injection. 2 key/paddle input jacks, one each on front and back panels. CW Tuning Indicator on the Main display. The FT-1000MP is ready for direct connection to a computer's RS-232C serial port. The built in RS-232C computer interface of the FT-1000MP utilises a convenient DB 9 serial connector from the level converter. The FT-1000MP includes a compact switching regulator power supply, specifically designed for low noise and a wide acceptance of input voltages (90-129V and 180-258V). 13.5 V DC can also be supplied from an external power supply DC-only model (FT-1000MP/DC) also available. For base, emergency or DXpedition use, the FT-1000MP is ready for action. In addition to 11 receiver input bandpass filters, the FT 1000MP includes 3 automatically selected high-pass filters which provide superb immunity from 2nd order IMD. IF filter selections can be cascaded to combat QRM and tailor received audio. With 2 banks of independently selectable filters, one bank each for the 8.215 MHz 2nd IF and 455 kHz 3rd IF the FT-1000MP provides the solid IF filtering required in today's crowded bands. The Dual mode IF Noise Blanker provides outstanding rejection of narrow impulse type (NB1) noise or wider "woodpecker" type pulses (NB2). The blanking threshold is adjustable front the front panel. The bargraph segment of the meter above the Main frequency display serves as a dual mode enhanced tuning scale, providing a visual indication of relative offset during Clarifier ("RIT") operation. Never before has such a wealth of information been provided on a transceiver display. In addition to independent frequency and S meter displays for each VFO the display area indicates power output, PA collector current, SWR ALC level, RF speech processor compression and PA input voltage, microphone gain level as well as Clarifier offset, memory information, and directional tuning scale to assist in precise tuning. To expedite set-up of the FT-1000MP in a split DX pile up the "Quick Split" feature can be enabled from the menu system. Activated by the A B button, the Sub VFO is placed in the same operating mode as the Main VFO, separated by a convenient offset (e.g. "up 5"). The FT-1000MP includes several scanning functions which are indispensable in keeping track of activity, These are: *Band Scanning, *Memory Scanning, *Sub band Limited Scanning. Certain memories may be "tagged" to be skipped during scanning, such as, for example, WW. The scanner will resume when the squelch closes or after a preset time delay. The FT-1000MP provides 2 main antenna jacks ("A" and "B") with front panel selection of the best antenna for current conditions. Additionally, a separate RX only antenna such as a low-band loop may be connected to the RX ANT jack on the rear panel; the "A" or "B" antenna will then be used for TX and the low noise loop for RX. Providing the foundation for the remark ably clean RX and TX performance, the local oscillator system of the FT-1000MP is the key component of an overall commitment to signal purity. High transmitter C/N ratio, an exceptionally quiet receiver, and quick switching time are the results of this design philosophy, while the conservative ratings of the 2SC2879 PA transistors ensure many years of trouble free competition grade performance. The FT-1000MP is ideal for digital modes! In addition to the dedicated input/output/PTT jacks for FSK and AFSK operation, the EDSP system includes 3 filters specially tailored for digital modes. Furthermore, the frequency display can be programmed to indicate either the center frequency of packet tone pairs or the actual carrier frequency.